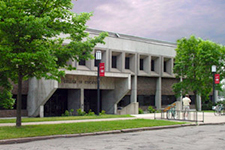 The Education Building, built in 1971, provides facilities for secondary, elementary and special education programs. The Education Building also houses the community psychology program, psychology laboratories, communication disorders, counselor education, and student teaching. From 5th Avenue turn east on 8th Street S. Follow 8th Street one block to 4th Avenue, turn right; the Education Building is on the left. The nearest public parking is the 9th Street/4th Avenue pay lot. Street parking may also be available.